There is evidence of early Pictish settlements in Moray, where Brodie castle is located and that Brodies were in possession of the estate in 1160. It appears that Malcolm, Thane of Brodie (or Brothie), was a descendant of the old Pictish aristocracy. His son Michael was granted a charter for property in Moray by Robert the Bruce, not for services rendered but because of an ancient right of his ancestors. 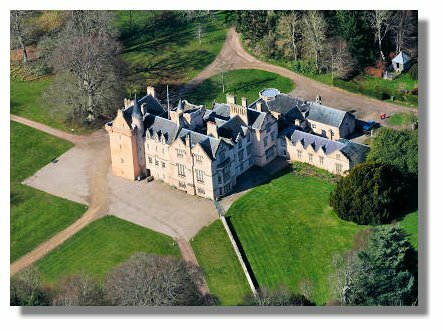 The Brodies still live in the castle after 35 generations from Malcolm, though these days the building is administered on behalf of the nation by the National Trust for Scotland. The present building is dated to 1567 with that date carved on the south-west tower, though parts of an earlier structure may have been incorporated. The lands had been forfeited briefly because the 12th laird, who had become a staunch Presbyterian, had opposed Mary Queen of Scots. In 1645 the castle was burnt and plundered by Lord Lewis Gordon because the 15th Brodie laird was a Covenanter. It was as a result of this destruction that many of the earliest records of the Brodies were destroyed. Alexander, the 15th Brodie of Brodie (1617-79), was a staunch Presbyterian who was among those who destroyed carvings and paintings in Elgin Cathedral in 1640 because he considered them to be idolatrous. The 15th laird was also part of the commission that negotiated with King Charles II in The Hague and at Breda in 1649/50. Being involved in this resulted in considerable expenditure for which the laird was not recompensed by Charles after the Restoration in 1660. In 1727, Alexander Brodie of Brodie, the 19th laird, became Lord Lyon, King of Arms, responsible for heraldry in Scotland. There is a striking portrait of Alexander in his official robes on display in Brodie Castle. Alexander was Lord Lyon during the Jacobite Uprising and supported the Duke of Cumberland during the campaign against Bonnie Prince Charlie and his supporters. It was Mary Sleigh, the wife of the 19th laird who was responsible for laying out the present ornamental grounds in 1730 and the castle was expanded on a number of occasions. This sometimes resulted in descendants struggling with the burden of debt - a fortunate marriage by the 24th laird in 1838 to a wealthy heiress paid for major alterations made in 1824. The castle and its main state rooms as well as the grounds of the estate are now open to the public. In the spring, Brodie has a magnificent daffodil display. 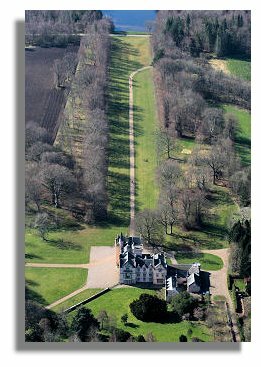 Note: The photos of Brodie Castle on this page are copyright Scotavia Images who provide a quality aerial photography service for Scotland. Prints from their large online gallery are available for purchase. If you have ancestors with a Scottish Highland origin, they can provide an aerial view of the area they came from! or go to the next castle: Broughty Castle.